Ask fellow campers about "Washoe Lake State Park" and nearby attractions. Great CG, plenty of room between sites, quiet, bargain priced. No extra charge for toad. No hookups but there is a dump station with water available and there are several water spigots available in the CG. Each site has a shade structure over the picnic table. Originally signed in for two nights just in case it wasn't satisfactory but ended up staying 7 nights (the maximum allowed in a 30 day period) as we explored the Carson City area. Lake Tahoe and Reno are each about 30 minutes away making this an excellent base camp. We camped at Washoe Lake State Park in a Motorhome. Beautiful campground and for the beginning of March it was not very crowded with only about 12 sites taken. There were even people tent camping and the rain did not scare them off. The lake is full and the scenery is magnificent! Very quiet campground and very relaxing, as dry camping should be. We camped at Washoe Lake State Park in a Motorhome. Check out the Miners Maze and disk golf while at the park. They are near the main boat launch ramp. There were plenty of sites available when we got there around 8:30 in the evening. The ranger station was closed, so we put the overnight fee in an envelope and dropped it in the indicated spot. The envelopes tell you how to make out a check if you want to do that. Even though it was July, the temperatures were reasonable in the evening. There are two loops; we stayed in the 2nd one since it was the first one we saw. The rest room building has a shower but the door for it doesn't have a label. The spots were level, there were some trees and a lot of scrub and jackrabbits, and picnic areas with roofs over them to keep off the sun. 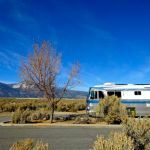 We camped at Washoe Lake State Park in a Motorhome. Love this dry campground. Sites are well spaced so you can't look into your neighbors windows and most are very level. Quiet a number of pull thru sites but back ins are wide and easy to use. We stayed two days and pretty much had the place to ourselves although nights it filled up with travelers. Jack rabbits were our main neighbor. The dump was flooded so it was closed and didn't appear that it would open soon, so if that is an issue you might want to call ahead to ask. Bathrooms were clean, well stocked and showers were wonderful and hot. Water available. We plan to go back soon. We camped at Washoe Lake State Park in a Motorhome. Sites are level and most are large with some being pull through. Sites have a nice size canopy over the patio. Be aware that this area is very dry (lake is dried up) and can be sandy when the wind blows. Views are fantastic especially at sunset. We camped at Washoe Lake State Park in a Motorhome. The wife and I saw at one time at least 300 hundred deer eating on freshly cut hay just bout 1/2 mile north of campground. Very expensive! We had to pay the double price of $34 because we drove our tow car to the site instead of towing it. What difference does that make? Restroom and shower were already closed. Absolutely no service, but very beautiful sites and beautiful environment. We camped at Washoe Lake State Park in a Motorhome. Are you affiliated with Washoe Lake State Park ?